Some hot springs not only useful for the mind and body, but also incredibly beautiful. Before you the top 10 most picturesque places of healing thermal water from different countries of the world. This is the real pride of Yellowstone national Park. 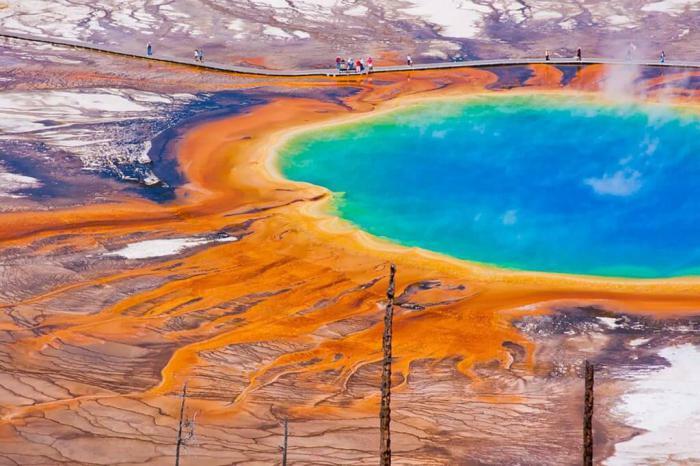 Grand prismatic spring is the third largest on Earth and is renowned for mesmerizing variegated color. Thanks to pigmented bacteria in the pond shimmers with orange, yellow, green and blue hues. The color of the water depends mainly on its temperature: the higher it is, the more red and orange tones. The water in the Grand prismatic source, extremely hot – the average temperature of Yellowstone's "boiling lake" reaches 71 degrees Celsius. The maximum water depth is 36 meters and a diameter equal to 112 meters. Pamukkale – one of the most visited tourist sites of Turkey and looked at the plateau, you will understand why. Its travertine terraces are an incredible beauty white castle with blue streaks of shining waters, which attracts travelers like a magnet. It is noteworthy that the appearance of a natural wonder fully corresponds to its name – in Turkish Pamukkale means "cotton castle". This place is also attractive for its historical sites. 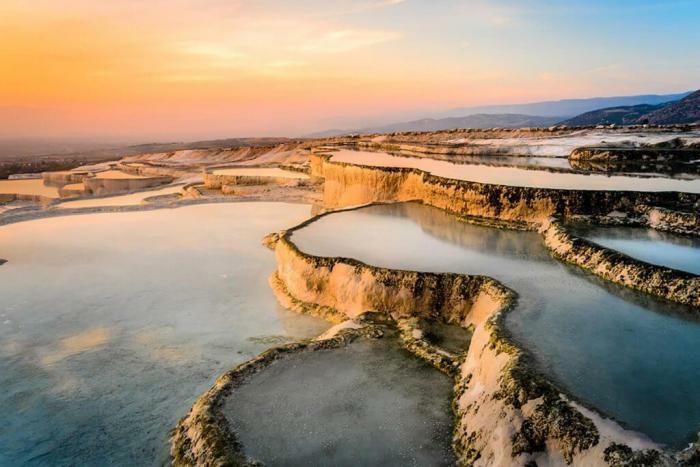 Next to Pamukkale is the ancient Greco-Roman city Hierapolis, and who wouldn't want to swim in thermal springs and at the same time explore the heritage of ancient civilizations? Located on century-old lava field is Iceland's lake is a true natural wonder. 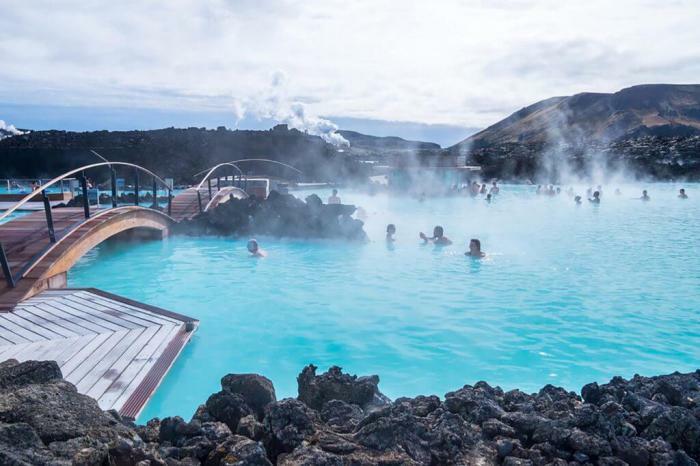 The blue lagoon is filled with nine million litres of geothermal sea water with an average temperature of 36-38 degrees Celsius. As stated on the official website of the resort's special "hybrid fluid", have emerged as a result of mixing soil and sea water. It is extremely rich in mineral salts and is very useful for the body. By the way, the depth of the healing pond is relatively small-five feet, making it perfect not only for swimming but also for relaxation. 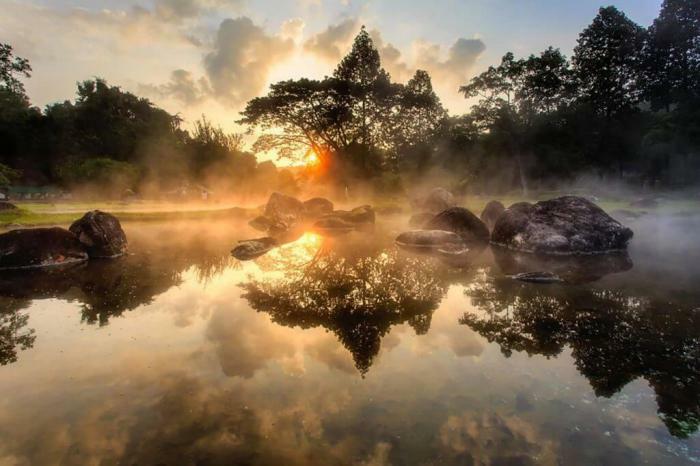 Thailand is home to one of the most impressive hot springs in the world. Jaya Sorne is situated among picturesque rocky landscapes of the national Park Tea Sleep. It is especially beautiful in the morning, shrouded in mist and bathed in the sun. 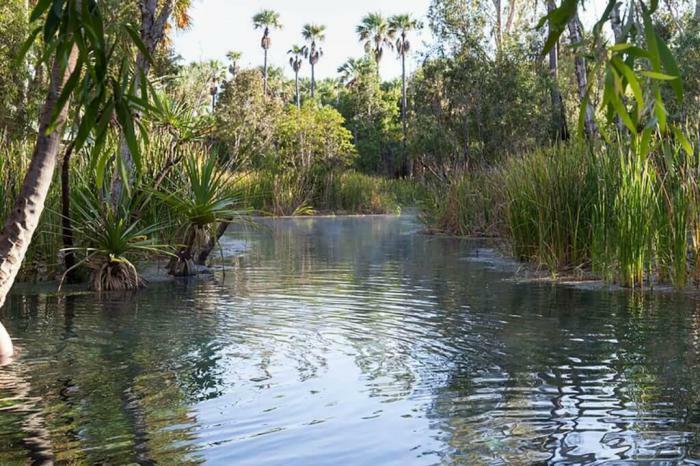 The average water temperature in Jaya Sorne varies from 80 to 100 degrees Celsius. Of course, it's too hot to swim, but she had found another application – locals and tourists often fried in hot spring eggs can be purchased nearby. This thermal reservoir is located in the volcanic rift valley Waimangu. "Hell's crater" is recognized as the largest hot spring in the world. The lake is about 29 feet deep, and its temperature ranges from 35 to 80 degrees Celsius. The color "Hell" crater is directly dependent on the water level. 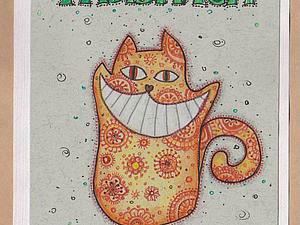 It varies cyclically, with each cycle lasting 38 days. At low water level the lake has a dull gray color, and high – rich azure hue. 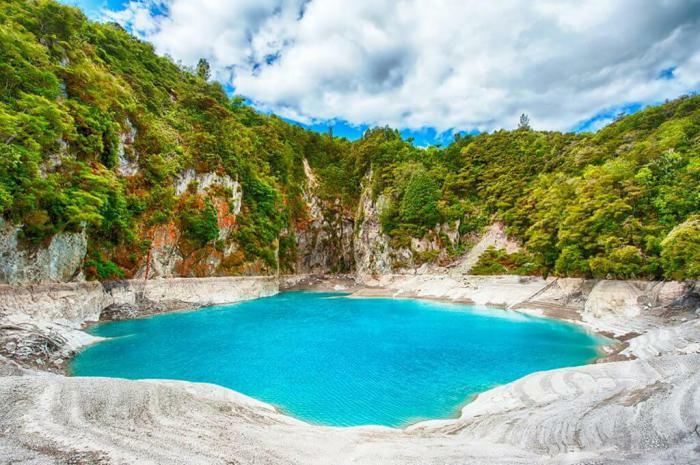 As "Hell's crater" is a lake located in the volcanic rift valley Waimangu. "Sizzling frying pan" is also one of the biggest hot spring on Earth, though somewhat inferior in size to its "colleague" at the location. The pond appeared in 1917 in the eruption of the volcano – then in its place there was a crater and filled with water. 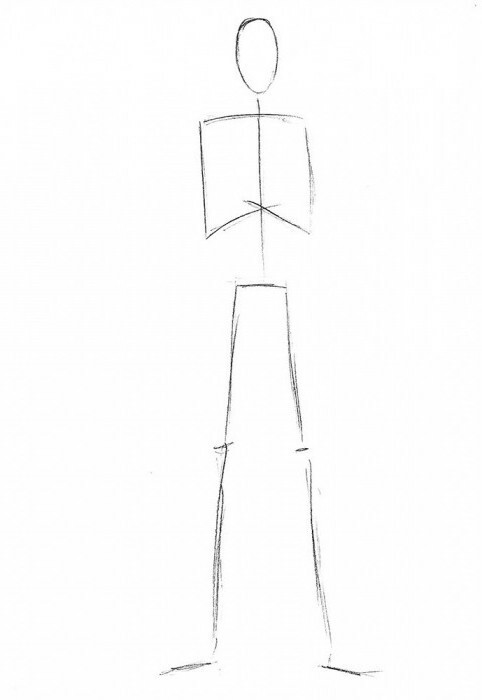 The lake is constantly bubbling up and makes sounds Sizzling frying on the fire, which appeared his unusual name. Water temperature in "boiling" in the reservoir reaches 50-60 degrees Celsius and its maximum depth is 20 meters. Color "Sizzling frying pans" is changing as well, like "Hell's crater". 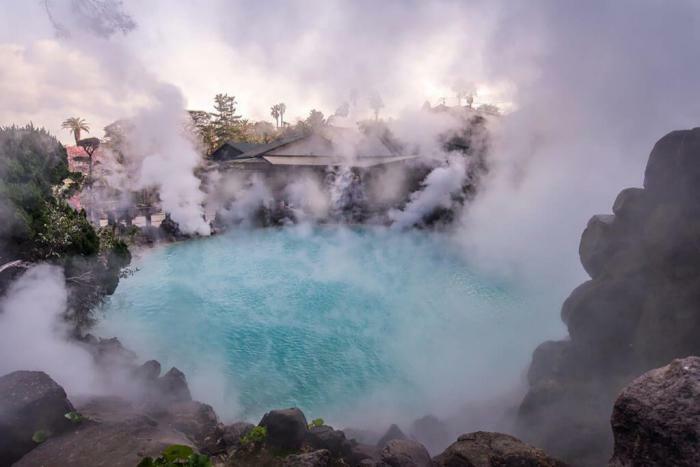 Among the eight hot spring "Boiling hell" of Beppu, UMI-Jigoku is one of the most beautiful. The pond has an unusual cobalt blue color and is surrounded by extensive green gardens. The story of the "Sea hell", as it is often called, began over 1300 years ago when the eruption of the nearby volcano Tsurumi. Despite its beauty, UMI Jigoku is not suitable for swimming: the water depth of nearly 200 metres and the water temperature can reach the mark of 97 degrees Celsius. 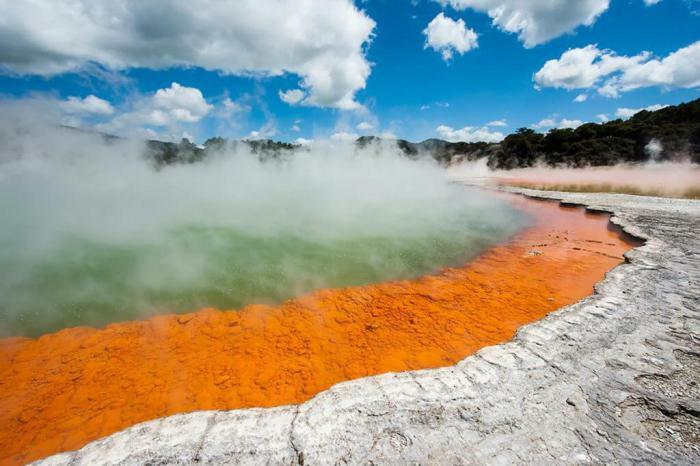 As you can see, New Zealand – true fount of hot springs. Another thermal reservoir – Maruya – surrounded by a breathtaking mountain landscape of the national Park Lewis Pass in the South island. The average temperature of the waters of Maruji varies from 35 to 41 degrees Celsius, so they are the perfect vacation spot both for locals and for tourists. Located in the national Park Morne Trois Pitons, this hot spring is recognized as the second largest on the planet. The lake on all sides surrounded by mountains, and over his blue-gray swirling waters spread pairs containing large amounts of sulfur. 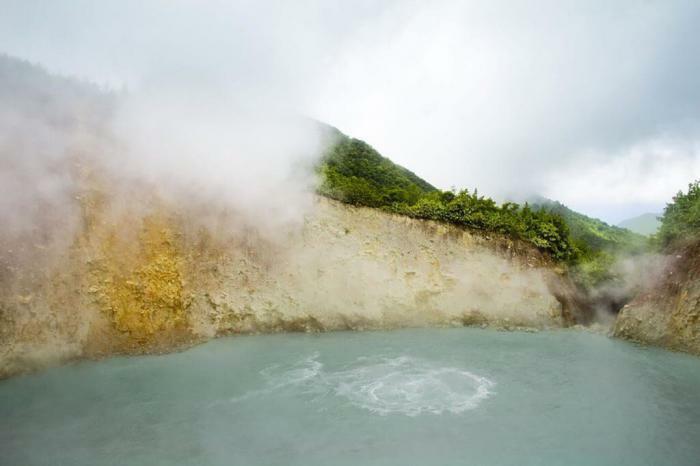 The depth of the Boiling lake is approximately 60 meters and its temperature is 82–91 Celsius. In the rainy season it can drop to 10 degrees, however, to bathe in the source is strictly prohibited, because the water can beat jet hot air or even lava. If you plan to look at the Boiling lake, bring running shoes – to reach it, you will have to overcome the impressive twelve-kilometer-long route. Imagine that you are swimming in warm crystal clear water surrounded by tea trees and swaying palms. This holiday is waiting for you in the thermal pool Mataranka. Thirty-degree water will relieve your body from ailments and pains, and the Australian light breeze coupled with the picturesque landscape will give your spirit peace and tranquility. Perfect combination, isn't it?